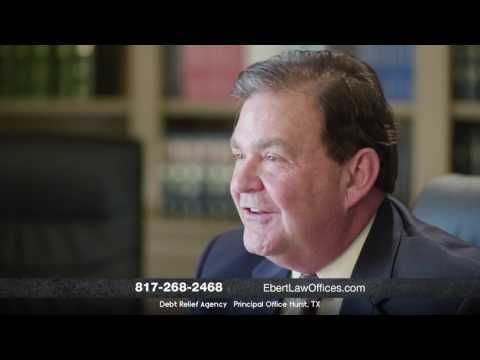 About Us – Reasons why you should pick Ebert Law Offices, P.C. We’re a refreshing firm with our sights set on helping you get a fresh start. We’ll help you get back to just being you. We bring a long and successful track record in helping clients remove or reduce their debt issues. We will look at every possibility to help remove you from the increasing burden of debts. We have a high success ratio of finding ways for people to keep their cars and homes and we can even help with IRS debts. We handle bankruptcy cases every day. It is our main focus and we are very good. Our combined legal experiences spans more than “50” years and we have been able to bring relief to small businesses, families and individuals all over the Fort Worth and Tarrant County region. Sitting down with us allows you the opportunity to see if Bankruptcy is the best course of action for you. We are regular people just like you and we welcome the chance to discuss your issues and look for a viable solution. David Ebert will work directly with your case. He has a very successful and experienced record of helping people overcome their debt problems. Bankruptcy doesn’t define you. With the pain and burden of mounting debt gone from your life, you and your loved ones can get a fresh start and get back to just being you. Fort Worth Bankruptcy Lawyer David Ebert is a lifelong resident of the Dallas-Fort Worth Metroplex and frequent lecturer on taxation, divorce in bankruptcy, and the Means Test. After graduating from Texas Tech University in Lubbock with a BBA in Marketing with Departmental Honors, David received his JD from the Southern Methodist University School of Law in 1994. He joined his father, Bankruptcy Attorney E. Bruce Ebert, in the family firm, and took over as Managing Partner in 1997. Fort Worth Bankruptcy Lawyer David Ebert is active in the community, serving from 2002 – 2009 as President of the Tarrant County Debtor’s Bar Association, and having served as Vice President and then President of the Tarrant County Bankruptcy Bar from 1995-97. He is a member of the College of the State Bar of Texas. He regularly writes on bankruptcy issues for a column entitled “Legally Speaking” in the Fort-Worth Star-Telegram. Fort Worth Bankruptcy Lawyer David Ebert has also been quoted in articles regarding bankruptcy in the Dallas Morning News and other newspapers around the country. When Maggie first started at Ebert Law Offices, she was just a small pup looking to make a name for herself in Hurst, Texas. Since joining the firm, she’s grown 6 inches, gained 5 pounds, and mastered the art of polite barking and sniffing. A social butterfly, Maggie greets all of our guests here at the office and is known as Ebert’s Official Greeter. She’s a hard worker, often here five days a week, and is one of the firm’s most trusted confidants. But be warned, she loves scratches just behind her ears and if you dare indulge her, she may not let you leave. – P. H. C. H.